It’s Day 5 on our Marlon Brando spotlight and we’re talking about one of the best, if not the best, film of all time, The Godfather!! It’s the story of an Italian-American crime family (led by Brando’s Don Vito Corleone) and a war that breaks out between them and the other “families” of New York. It’s about the American Dream, family, Hollywood, corruption, capitalism and so much more. Scene after scene is fantastic, with each one somehow topping the last. Currently, it sits at #2 on IMDB’s Top 250 list (with The Shawshank Redemption at #1) while its sequel is right behind it at #3. It was nominated for 11 Academy Awards and won 3 of them, including Best Picture. It also connected well with audiences and was the highest grossing film of 1972. To say it was an unmitigated success would be an understatement. But, of course, as many of you already know, the production was oftentimes a nightmare and very chaotic. 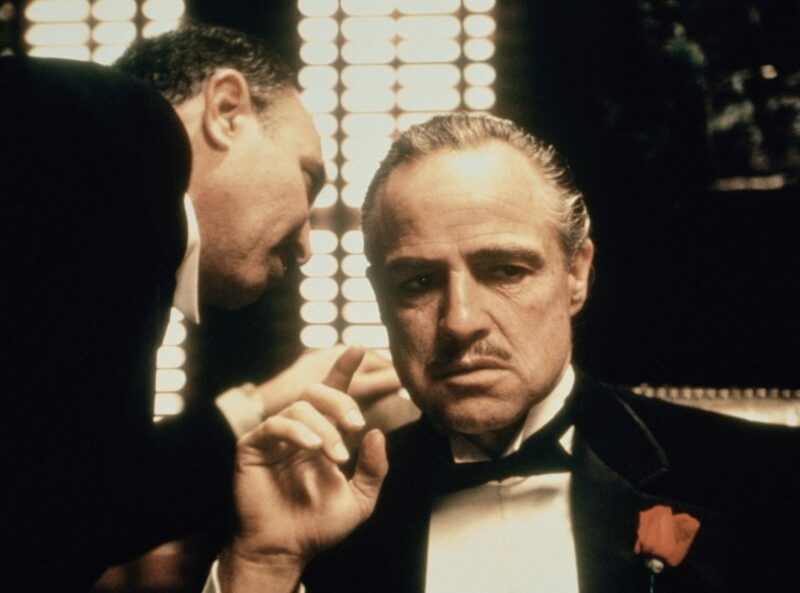 The studio didn’t want Al Pacino or Marlon Brando and they fought with director Francis Ford Coppola constantly over them as well as nearly every other issue they could find. It seemed no one thought the movie would be a success. These were insulting to him, no doubt, but he ended up playing what would become one of cinema’s all time great characters and giving one of the best acting performances in the history of film. The rest of the cast is great (perfect, actually) but Brando steals the show and gives the movie its much needed emotional core. That you can root for the Coreleone family is a testament to his acting. Many of you may think of him as being older when this film was made, but it’s only because of the incredible makeup he wore for the part; in fact, he was only 47 years old during production. That makes the performance even better, even more nuanced. This is Brando at his finest, and his career was resurrected. We’re winding down our Spotlight, but Kelley will return tomorrow with one of her favorite Brando films, Last Tango in Paris. Or is that one of her least favorite Brando films? I can never remember.